Zombies, Shakespeare, and Apes – Oh My! 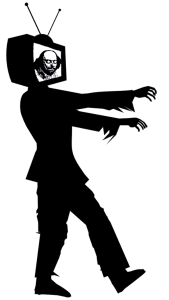 Zombie Shakespeare was such a cool event, because we tried something new here in our TV studio. We let the audience be part of the production! NECAT partnered with The Nashville Shakespeare Festival to create a one-of-a-kind event. Local actors were transformed by Artist-In-Residence, Rick Prince and his team of makeup artists into bloody, gory, fabulous zombies who then performed classic snippets from our favorite Shakespearean pieces. We filmed their zombified adaptations in our studio in front of the audience, who also appeared on screen. Audience members were not only given incredible performances by our local zombies, they were given a behind the scenes look at how TV is created. One of our favorite moments was when an actor’s mic stopped working and we were not able to capture the audio for TV, so we were going to have to redo the performance – we thought the audience would be so upset with our mess up. Instead, they cheered at the opportunity to see the actor perform again and loved watching the crew troubleshoot and set up the shots again. We learned not only how great our zombie actors were that night but how amazing our NECAT viewers and supporters are! The fun didn’t stop there! Closing out the crazy night was the Damn Dirty Apes – a line stolen from the movie Planet of the Apes. 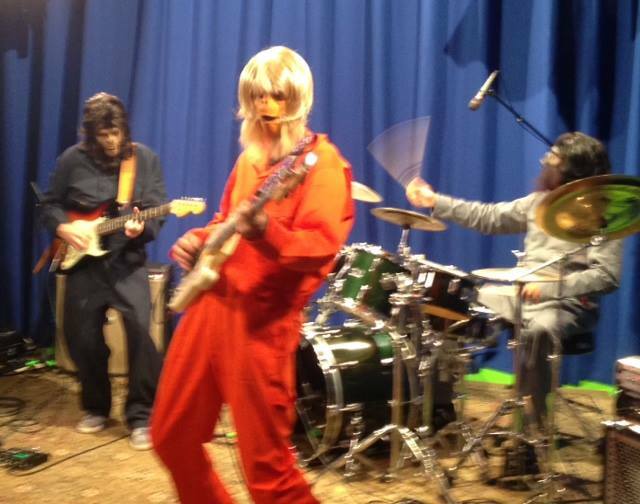 In full ape special effects prosthetics created by band member Jimmy Stinson the three apes performed their garage band funk music while our audience shook their booties on our studio dance floor! We loved this event and we can’t wait to do it again!! Check out all the amazing performances here! This entry was posted in Fun Events. Bookmark the permalink. Face Off Creations Wow The Audience!